Keynote Speaker, Charles Andres from Wilson Sonsini Goodrich & Rosati (WSGR) at GW TCO's Inaugural Startup Showcase. The George Washington University (GW) Technology Commercialization Office (TCO) hosted its inaugural Startup Showcase on April 17, 2018. This TCO Startup Showcase is a pitch event GW startup partners present on their success stories and commercialization trajectory. 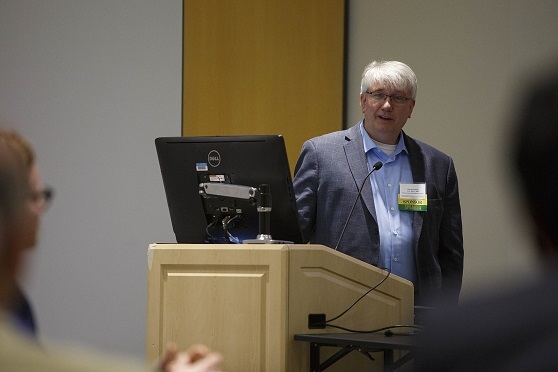 This event showcased four GW startups developing innovative university technologies. Experienced entrepreneurs, investors and industry professionals provided insightful feedback on the four pitches. Our 2018 keynote speaker, Charles Andres, from Wilson Sonsini Goodrich & Rosati provided an overview of the venture market including discussion of strategies for approaching the investment community and understanding alternative sources of funding. Nanochon, LLC, founded by GW alumni, uses 3D printing and a novel material to develop joint implants that not only replace lost and damaged cartilage, but also encourage new tissue growth. Nanochon’s large animal study will wrap up soon, with the hope of supporting an Investigational Device Exemption from the FDA for human testing. True Bearing Diagnostics, Inc. uses RNA biomarker panels, developed at the GW Division of Genomic Medicine, to guide precision care for cardiovascular disease, appendicitis, and respiratory infections. Their pivotal, FDA pathway, validation study on TruCAD, a blood test to assist with the diagnosis and potential for tracking of coronary artery disease, launched in 2017 and should complete by end of 2018. CardiaForm, Inc. develops medical devices, invented by GW researchers, to diagnose and treat cardiovascular disease. Their devices enable instantaneous high density, high definition electrical maps to support mapping unstable arrhythmias, reduce procedure time from 3-4 hours to less than 1 hour and provide improved procedural success using only a single catheter. CMR Innovations LLC is a company founded by a GW graduate student and is based on work performed under the supervision of his GW academic advisor. The company harnesses the benefits of the Internet of Things (IoT) to implement Smart Healthcare Logistics Systems for managing a variety of assets in the healthcare supply chain.